This hand cream 'The Handyman Can' protects and nourishes the damaged hands. Organic shea butter moisturizes the skin and ensures that the hand cream gets absorbed quite fast. 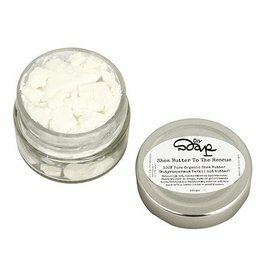 Mango butter moisturises and helps, together with the avocado oil, to repair the skin faster. In addition, the added avocado oil ensures that the hand cream is very suitable for extremely dry skin. Avocado oil helps the skin recover faster from small cuts and wounds and (sun)burn because of the many antioxidants it contains. The hand cream smells wonderfully fresh and floral through a combination of jasmine, lemongrass and vanilla. Essential jasmine oil works antiseptic and has anti-inflammatory properties. Jasmine oil is suitable for dry and sensitive skin. Lemongrass works cleansing and gives the cream a fresh scent, while vanilla creates a little sweetness. The hand cream is pretty thick and therefore a little goes a long way. The cream leaves a thin protective layer on your hands. Your hands immediately feel soft and protected! The cream doesn't get absorbed by the skin straight away, this takes half a minute to a minute. We already prepared this hand cream for you and it's always freshly made. The hand cream comes in a handy glass jar or can that fits in your (handbag) easily. 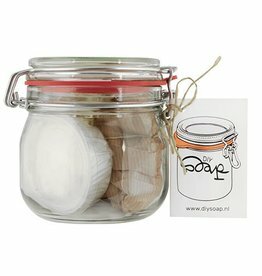 Contents: 30 ml glass jar or 50 ml can. The hand cream is 100% natural and does not contain parabens or perfume. The essential oils are 100% natural and contribute to the nourishing effect of the hand cream. In addition, your hands also smell delicious! Tip: take the jar of hand cream with you when traveling and use it in case of need as a leave-in hair conditioner or lip balm. Organic Shea Butter (Butyrospermum Parkii nut butter), Mango butter (Mangifera indica Seed Butter), Avocado oil (Persia Gratissima), Beeswax (Cera Alba), Jojoba oil (Simmondsia Chinenis), Vitamine E (tocopherol acetate), Lemongrass (Cymbopogon flexuosus oil), Vanilla oil (Vanilla Planifolia), Jasmine oil (Jasminum Officinalis).